We campaign for a safer, less congested, healthier and nicer junction at the Elephant and Castle. Transport for London propose a scheme that will make it more congested, polluted and dangerous for pedestrians. On the 28th March 2014 the influential London Cycle Campaign also recommended their members demanded a better junction and Say NO to The Bodge. 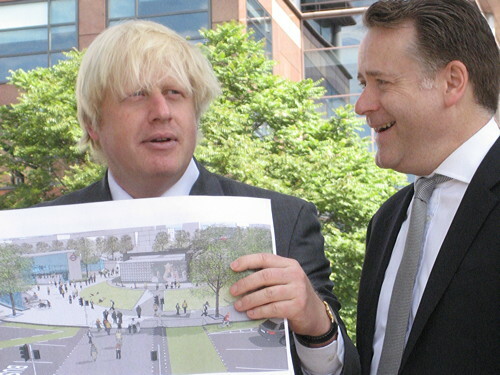 The only people championing the proposals are Mayor Boris Johnson, Cllr Peter John leader of Southwark Council, Transport for London's clumsy project team and local developers who need superficial change to market flats. No local organisation, campaign group or TRA has stood up to back the proposal publicly. It's a pig's ear at The Elephant. We have launched an alternative proposal for the roundabout, based on hours of consultation and analysis. Download our first alternative proposal here and view an animated commentary of the alternative proposal here. This junction needs some serious care and attention. 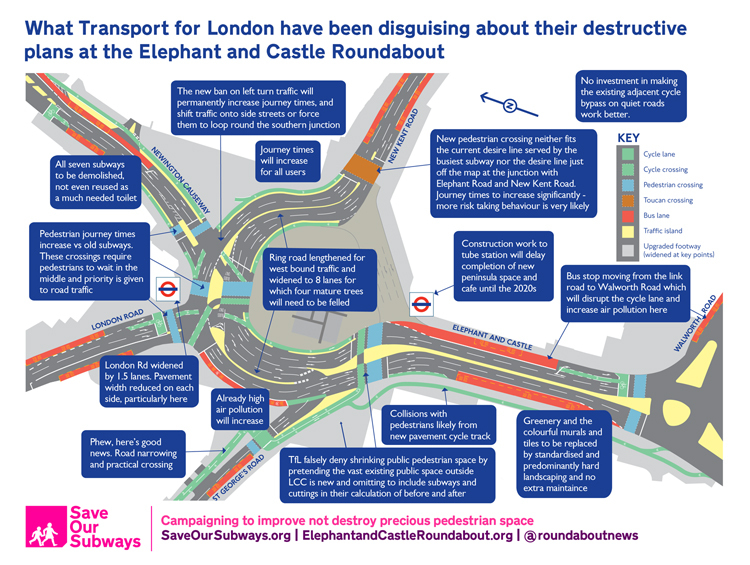 The roundabout is the heart of the Elephant and Castle, an intersection of roads, underground lines, communities, developments, council wards, a leafy green island in a sea of traffic, a listed memorial and a subterranean gallery of murals. Thousands of people pass around it, over it and under it* every day (*over 3,500 in one hour at peak use the subways). Thousands also live adjacent to it. But it's been neglected for twenty years and it's also dangerous for some users - not for pedestrians for whom it is no more dangerous than the average for the entire London road network. 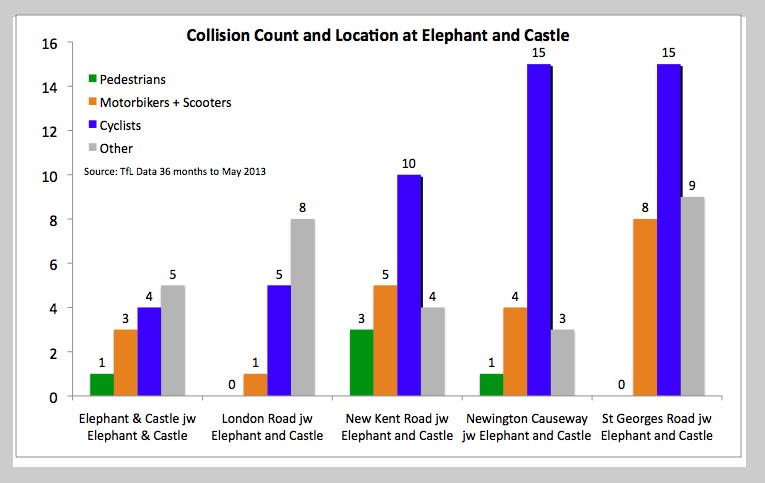 We've analysed and graphed the TfL collision data which shows the roundabout needs improving to make it safer, particularly for cyclists, motorbikes and scooters. It could be more pleasant for everyone and prepared for the district's thousands of forecast new residents and visitors. But Transport for London's proposals will make it worse. Review the data here. TfL have been perpetuating a myth that the subways are dangerous. Their propaganda could not be further from the truth. Our freedom of information request to the Met Police for crime figures for the subways vs the surface level within 50m of the junction for the three years to spring 2013 showed 978 incidents at surface vs just 19 in the subways, none of which were considered serious. The roundabout is a very busy part of London's strained transport network. It is part of London's strategic Inner Ring Road and on the southern border of the Congestion Charge Zone. It's also a stop on 28 different bus routes, a terminus for the Bakerloo line, a stop on the Northern Line and Thames Link overground railway. But Transport for London, the Mayor of London and Southwark Council want to turn a large portion of this busy hub into recreation space - despite there being five new squares and parks in development near by. The consequences of this pointless plaza are a bigger ring road, more congestion, pollution and an almost inevitably blighted place as people choose not to linger next to a chugging ring road. 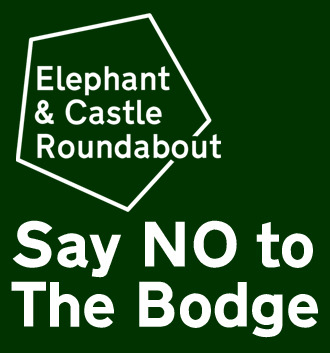 Please sign up to join the campaign mailing list and follow news from the roundabout on Facebook and Twitter. 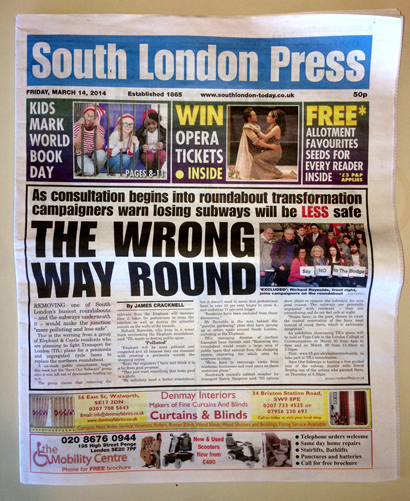 You can find out more details about the issues at Save Our Subways (which was the single issue that kicked off this campaign that has broadened since as more negative issues emerged). Today the roundabout is dilapidated. Neglect has taken hold as planners wait for the impetus of significant local regeneration to fund and direct the improvements. We agree the subways are unwelcoming to some visitors, particularly pedestrians new to the area who are easily muddled by the inaccurate signage. Cyclists do not mingle safely sharing space with motorists, because the unnecessarily wide roadway does not provide separate space for cyclists. Yet it's not all broken. The principle of separating pedestrians from users of the busy ring road by giving them uninterrupted crossings is good. Thousands of commuters and residents confidently and safely navigate the area on foot including the subways. Pedestrians are less at risk from muggings in the subways than on the surface say the Community Wardens, as well as sheltered from traffic collisions and the weather. TfL's proposals forcast longer journey times for everyone on average. The busiest pedestrian route will actually be 41% slower! Their modelling also shows it will be more polluted, particularly for residents on the western side including within council flats specifically for the infirm. A pointless new pedestrian square (when three new ones and two new parks are in the pipeline near by) has been prioritised over practicality. Transport for London are presenting the design for approval with a manipulative survey and a carefully edited artist's impression to give them the approval they want. It is important they hear back what is wrong and what could be done better. The plan will destroy the only space currently 100% for pedestrians. All seven subways would be demolished. Pedestrians would be forced to wait by the busy road for traffic lights or dare cross and hurry past up to six lanes of traffic in the few seconds permitted by the green man. TfL forecast pedestrian journeys would take up to 41% longer at the junction. The subway's shabby appearance need not be solved with demolition. . The proposals lengthen the inner ring road. By removing the south-eastern segment of the roundabout (the road nearest the shopping centre) ring road traffic heading to the New Kent Road is forced to go right around in the opposite direction - more than four times the distance, spending longer at the Elephant and Castle, pausing at up to three crossings, increasing air and noise pollution.